yourself to prickly characters like cacti and succulents. It’s impossible to predict what Mother Nature has in store for your garden, so I like to design with drought-tolerant plants. There are plenty of beautiful ones to choose from, so what’s to lose? The most common request from my clients is for low-maintenance gardens, and cutting down on the amount of watering a garden needs is probably the best way to achieve that goal. 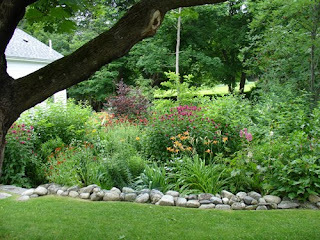 The garden in these photos is a continuously blooming one I designed and planted in 2008 in Camden, Maine. It was a redesign of an existing garden measuring about 30 x 40 feet. I started by cataloging what was already there (see Chapter Seven, Improving an Existing Bed, in my book The Ever-Blooming Flower Garden: A Blueprint for Continuous Color). Then I entered the plant names into a blueprint form and filled in the blueprint with everything needed to achieve continuous bloom through the seasons. The client’s chosen palette was a lot of fun — hot colors! 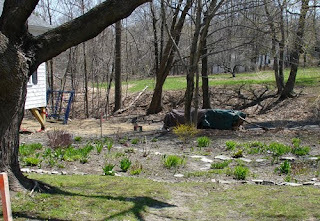 Next, my crew and I removed all the existing plants and set them aside. We then worked in about 10 cubic yards of good compost to a depth of at least 12 inches to improve the extremely clay soil — you only get one chance to correct clay soil to a decent depth, and this was it! Clay soil is very hard to rehydrate once it has dried out, so this step vastly improved the drought tolerance of the garden. heights, with various bloom times. To plan a drought-tolerant continuously blooming garden, start with a list of drought-tolerant plants. 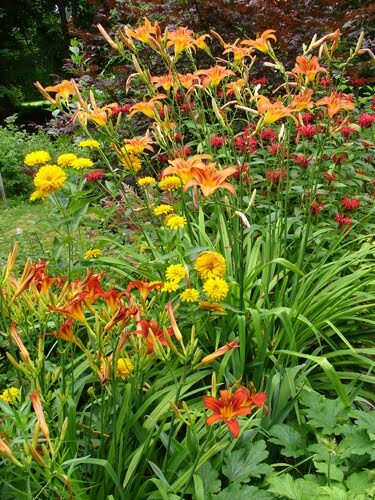 You might be surprised to find some of your favorite flowers on the list! The Internet offers many lists (just google “drought-tolerant plants”), but you should consider the reliability of the source (and your growing zone) and double-check what you find. Anything coming from a university Web site or from a botanical garden, such as the Missouri Botanical Garden, can be trusted. My book also provides lists of plants for dry sun and dry shade, on pages 200 and 201. 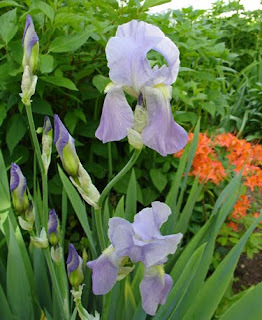 Drought-tolerant spring bloomers in this garden include bearded iris (pictured on May 28), Aurinia saxatilis (basket of gold) and Euphorbia polychroma (cushion spurge). Sundrops and purple smokebush stand up to summer heat. 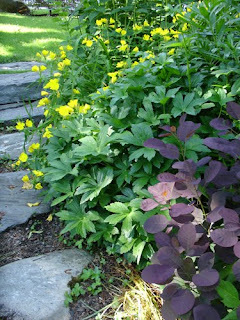 I love to mix up yellow and deep purple, so I planted a swath of sundrops (Oenothera fruticosa) near a purple smokebush (Cotinus coggygria ‘Royal Purple’) (shown on June 25). The foliage of sundrops can suffer in dry heat, but they always bloom reliably for me, and you can cut the stems down after bloom to reveal attractive reddish rosettes of foliage. I like to cut smokebushes off at about 18 inches above ground level in early spring so they send up deep purple stems and gorgeous purple leaves that are a perfect foil for almost any color flower. 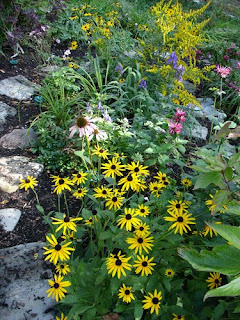 Midsummer can squeeze the life out of your garden unless you’ve planned for the punishments of dryness and heat. 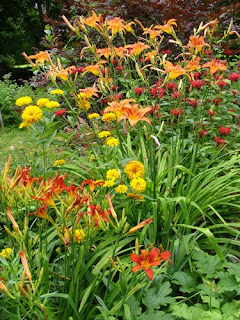 Daylilies think they’re in heaven and seem to say “bring it on!” I’ve found the key to fabulous daylily displays is to limit groupings to two varieties whose colors are complementary — mixed up jumbles of many colors just look messy to me, especially because of the hyperactive foliage shape. 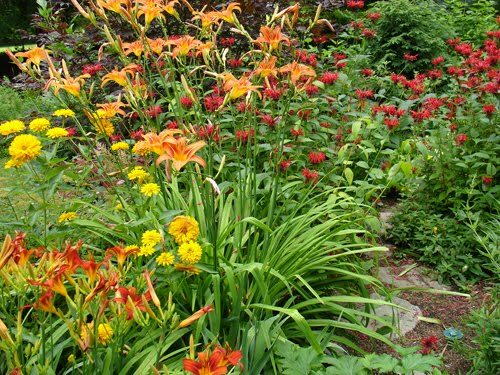 The photo above (taken on July 16) shows Hemerocallis ‘Chicago Apache’ and H. ‘Rocket City’, along with another drought-tolerant superstar, Heliopsis ‘Summer Sun’. In the background is Monarda ‘Jacob Cline’ (bee balm), a mildew-resistant cultivar that does need an average amount of water (and good air circulation) to remain attractive. A design point: this garden has a shady background, which keeps all the hot colors (red, yellow, orange and pink) from being overwhelming. Another way to temper a hot-colored garden in midsummer is to sprinkle in some blue Platycodon grandiflorus (balloonflower) throughout the bed to provide a cooling counterpoint. 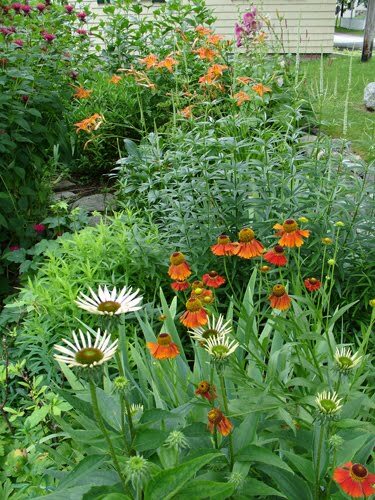 Echinacea (coneflower) and Helenium ‘Moerheim Beauty’ (sneezeweed) are great midsummer performers in Maine (shown on July 16). They need a little more moisture than the daylilies, but I still consider them extremely tolerant of dry heat. The Helenium starts out a deep, brick red and gradually fades to a beautiful bittersweet color over the course of its 4 or more weeks of bloom time. Nothing to sneeze at in the heat of summer! A preview of foolproof autumn flowers (photographed October 6, 2008) in this garden shows black-eyed Susan (Rudbeckia fulgida ‘Goldsturm’) and Solidago rugosa ‘Fireworks’ (goldenrod). ‘Goldsturm’ is the only perennial that blooms so long (8 to 11 weeks in Maine) that it makes me want to say “enough already!” That’s not such a bad defect for a perennial, and if you’re really sick of it, you can always cut it back and enjoy its perfect deep green foliage. With a little knowledge and research, you can have bountiful, lush blossoms throughout the growing season, including during the dog days of summer, with very little effort! Lee Schneller is the owner of Lee Schneller Fine Gardens, Inc. and the author of The Ever-Blooming Flower Garden: A Blueprint for Continuous Color; www.LeeSchneller.com.